What a change in the weather - Thursday night we were cold and damp at Kimberley, today bright sunshine and blue skies and not a runny nose in sight!!!! Where to start? Well, let's start with the,as usual, excellent programme supplemented with a copy of the team sheet -- 40 pages and well worth the £1.00. 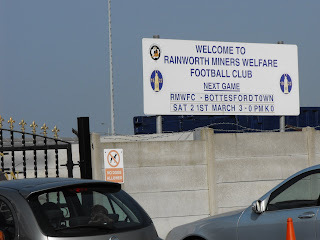 Into the ground and managed to grab a few minutes with Rainworth's Richard Smith - "Smig" is a friend from our Eastwood Town days - and he was lamenting the fact that the Wrens are to play the Badgers on 31st March and he is suspended. We had a word with James "Topps" Whitehead as well. The Rainworth right-back is currently on the road to recovery after suffering a serious injury a few weeks ago. He thinks he is still a couple of weeks away from playing. 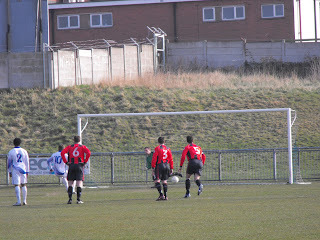 I wonder if HE will be fit to play against former club Eastwood Town? Rainworth currently lie third in the table, and look likely candidates for promotion along with Scarborough - although Askern Welfare are in second spot, apparently their ground grading is not sufficient to warrant promotion. With this in mind, it is important for the Wrens to keep winning and hold onto that third spot. Bottesford are in 7th place so we thought this would be a close game - and it was - a lot closer that the final score suggests!! 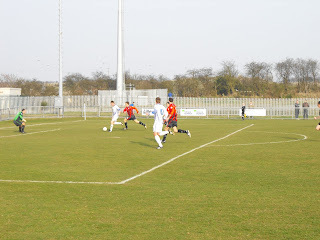 After the usual early sparring, the home team were awarded a contoversial penalty in the eighth minute. Raised eyebrows from both me and Kev - but PHIL BIGNALL didn't care - he stepped up to fire his spot-kick past Steven Jordan to give the Wrens the lead. 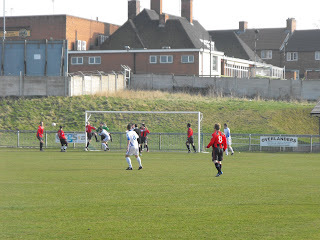 Rainworth looked fairly comfortable at the back with the Town strikers offering little or nothing - and in the 23rd minute, when Jermaine Hollis tripped Luke Clifford who was heading away from the goal, his fellow defenders couldn't believe it....there was absolutely no danger. Hollis got out of jail though - Bottesford's Jamie Smith hammered the penalty againt the post and lashed at the rebound - only to realise too late that he can't kick the ball again - result? 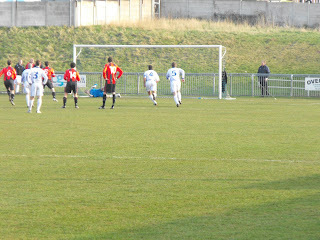 A free-kick to Rainworth. Decided against tea / coffee ... remembered what it was like on our last visit - this was actually mentioned to me at pitchside later by Sue Funk, wife of the Wrens Manager ....she assured me that the drinks are now ok. We'll try one at the Eastwood game, Sue! The visitors strated the second half well enough and asked a few more questions of the home defence - culminating in yet another penalty. 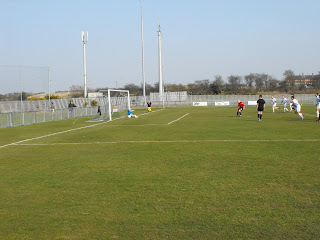 A long shot by Jamie Smith was well saved by Hales and then he tipped the subsequent corner over the bar .... another corner, this time the Referee saw something and awarded the penalty. 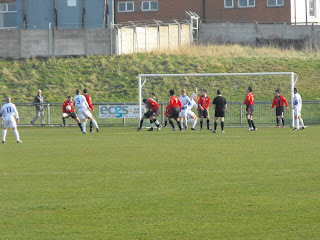 Up stepped Town skipper Daniel Hope to take the kick, but Hales dived to his right to save. As Hope ran in to look for any scraps, he appeared to catch Hales and a 20 man melee ensued. 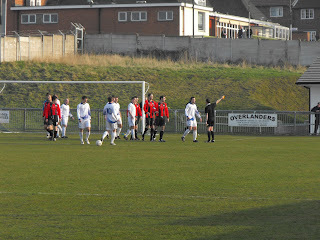 As things calmed down, Rainworth defender Matt Draper was shown a straight red for something or other.... He went ballistic and only a few words from Chariman Brian Reece calmed him down. Regular readers of this blog will know that we have not been too critical of referees this season. But Mr. Colin Barraclough was in a class of his own. More free-kicks than you could shake a stick at, 3 penalties that left everyone scratching their heads, a red card, several yellows -- and this was by no means a dirty game! This was an entertaining game and you have to wonder how good it would have been if not for such over-zealous Refereeing. Brilliant post, but I thought you may have gone to Teversal to see Scarborough Athletic win their promotion. Well done to all at Scarborough. Hope you enjoyed your day at Tevvie... just need to get the title now!! Just need another 4 points to guarantee it.